GLOBALLY SPREADING Busworld Academy (the ‘knowledge’ section of the massive Busworld (Kortrijk) events) and UITP (worldwide-influencing "passionate champion of sustainable urban mobility") have extended their strategic partnership to collaborate for the International Bus Conference in Belgium, to be held October, 2019, it’s been announced recently. The agreement – jointly signed by Busworld Academy president Redgy Deschacht and UITP secretary general Mohamed Mezghani - continues the relationship between UITP and Busworld Academy. The agreement – jointly signed by Busworld Academy president Redgy Deschacht and UITP secretary general Mohamed Mezghani - continues the relationship between UITP and Busworld Academy, which has seen joint conferences on regional events, such as Busworld Latin America (Medellin, 5-7 December, 2017) and Busworld Russia (Moscow, 23-25 October, 2018). Since the Busworld Europe exhibition is moving to Brussels in 2019, the International Bus Conference will see the event take place at the Brussels Expo Centre in the Belgian capital for the very first time (18-23 October, 2019) with the previous edition taking place in Kortrijk (23-25 October, 2017). The new venue and location are a unique opportunity to organise the biggest International Bus Conference ever, organisers state. 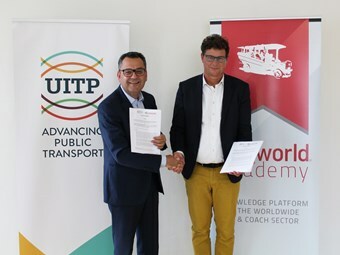 "After two first very successful joint events in 2017 at Busworld Europe and Busworld Latin America, Busworld Academy is more than happy to extend and intensify its collaboration with UITP. This will result in more joint conferences and seminars in Russia later this month and in Belgium during the very first edition of Busworld Europe in Brussels in October 2019," said Jan Deman, Director Busworld Academy. "Other possibilities are under consideration. It is clear that Busworld Academy welcomes UITP as its prior urban public transport conference partner and I am sure we will continue this positive vibe with new collaborations in the future!" The first edition of 2017 was a huge success with sold-out status and almost 500 registered participants for the three-day conference, it’s stated. By joining forces Busworld Academy and UITP brought together the oldest and most famous bus and coach exhibition and UITP’s global expertise, organisers say. The conference allowed visitors of the Busworld Europe exhibition – which attracted more than 37,000 visitors from 118 countries with 376 exhibitors from 33 countries - to complement their visit with rich insights and practical takeaways from the established UITP International Bus Conference. Hundreds of exhibitors have already registered for the 2019 edition and information on the Conference – including the speakers and programme – which will become available at a later date. "Today’s announcement with Busworld Academy is another solid step in our journey to build on our foundation on knowledge, networking and outreach and become a leader in the new bus era," said Arno Kerkhof, UITP head of Bus Division. "This partnership will help us fully deliver on our global growth strategy by giving us strong back-end capabilities and business foundation with the well-established and renowned Busworld exhibition. "Busworld Academy is the perfect partner to help us fully realise the world leading ‘must attend bus event’ in the long term." Busworld Academy is Busworld’s knowledge platform. Its main activity consists of sharing knowledge through the organisation of conferences, seminars, workshops and networking moments. Founded in 2013, it has joined many Busworld exhibitions around the world, completing the experience of visitors and other stakeholders, it’s stated. The Busworld exhibitions have existed since 1971. The oldest and most important exhibition is Busworld Europe, say organiers. Today, Busworld has seven satellite exhibitions in other regions where the bus and coach industry plays an important role: Turkey, China, India, Latin America, South East Asia, Central Asia and, last but not least, Busworld Russia, with an exhibition and seminar taking place soon from 23-25 October, 2018, in the Crocus Expo in Moscow. The International Association of Public Transport (UITP) is a passionate champion of sustainable urban mobility and is the only worldwide network to bring together all public transport stakeholders and all sustainable transport modes, it says. It has 1,500 member companies giving access to 16,000 contacts from 96 countries, it’s claimed. Its members are public transport authorities and operators, policy decision-makers, research institutes and the public transport supply and service industry, it states.